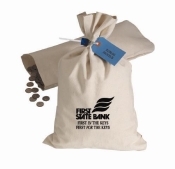 Economical bags for coin and currency transport. Bags meet Federal Reserve standards. Used by banks, retailers, and gaming establishments. 10 oz. canvas and double stitched seams hold extremely heavy coin. Bags can be secured with coin bag seals sold seperatly. Please call for custom imprint quotes. Sold in lots of 25 bags. Priced each.